Kale is something I was required to eat as a child, raw from the garden after weeding duty. My siblings found clever ways of disposing theirs (throwing it out the window while driving, etc). I was not a fan. So when I started seeing recipes for Kale Chips, I poo-poo'd the whole idea. "I don't like kale, it is like chewing on waxed paper." But more and more friends I trusted were trying it... so one day when a bunch of kale was on sale, I gave in. "Worst case scenario, I try it out and still don't like it, and I'm only out 99 cents." Lo and behold, it's all about how it's prepared! and I liked it! I did a little experimenting to find a combination of methods that made my perfect crisps. Special thanks to some friendly advice from Jasmin who makes kale salads, Emilia who suggested liquid aminos, Fitandfabby40's video tutorial, and Dara who makes a spicy version. In a large bowl, place kale and drizzle olive oil over it. Now massage the kale! make kneading motions through the leaves. You'll notice after a few minutes, the coloring changes and the amount of kale shrinks down somewhat. 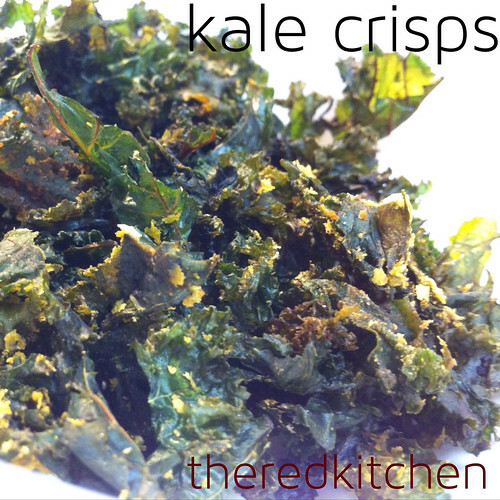 This makes the kale more like crisps than chips, melting in your mouth when you eat them. Place a silpat or other baking sheet liner (parchment paper may work) on a large cookie sheet. Spread the kale out as evenly as possible. Spray the liquid aminos over top evenly. Add salt and pepper, and any additional seasonings you would like. Bake in a preheated 250 oven for 20 minutes. The low temperature will dry out the chips without browning them. After 20 minutes, use tongs to lightly toss the chips, flipping them over a bit, and put them back in the oven for another 10-20 minutes. Taste them to see if they are to your liking to determine if they need more time.